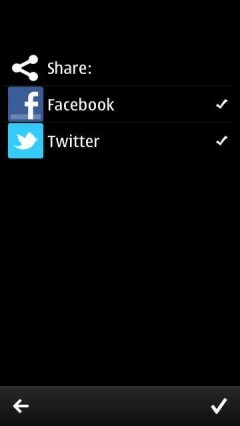 Update 22-Feb-2012: Nokia has released an update to the Social app that fixes the Sharing bug described below. A hard reset is no longer needed as updating Social restores the abilitity to share images from the Gallery to Twitter and Facebook. To install the update eithr run Software Update on the phone or use Nokia Suite’s Phone Update feature. 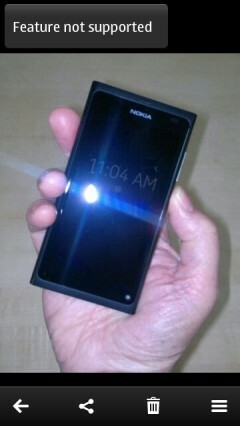 Updating my Nokia N8 to Belle went pretty smoothly. I didn’t encounter the any of the email sync or unresponsive UI issues that some users are reporting. However I was hit the “Feature Not Available” Sharing Bug. The bug appears when you open an image or video in the Gallery and tap the Share icon. That’s supposed to pop up a menu (image, right) that allows you to send the picture or clip to your Twitter timeline or Facebook wall. But when I tapped it I got a delightful “Feature not supported” error (image left_. The sharing bug is mentioned in an All About Symbian’s post listing potential issues that Belle updaters might encounter together with fixes and workarounds for some of them. According to that post, the bug only occurs if you have updated to the 1.4 or 1.5 version of the Nokia Social client. This seems to be the case. I did update Social from the Nokia Store immediately after installing Belle and I had the bug. My friend Lenny @THE_TRUTH34 at Nokia Innovation hasn’t updated Social and his sharing works fine. The Social 1.5 update seems to have disapeared from the Store, further evidence that something wasn’t right with it. There’s a thread on the Nokia Support Discussions forum where several people have reported the error. A Nokia employee has posted “We are currently working on a fix. The fix will be included in the next software version.“Another poster claimed that uninstalling Social 1.5 and installing Social 1.3 fixed the problem for him. The bug annoyed me so I decided to find a fix. Here are the things I tried, none of which helped. A Soft Reset (hold down power button until phone vibrates 3 times) – this had no effect. Finally, I did a hard reset (Settings > Phone > Phone management > factory settings) and it worked! I now have Social 1.3 and a working Share icon in the Gallery. If you decide to hard reset your phone please remember that doing so will delete every file, contact, song, app and customization on your phone, including everything on E:Mass memory. To avoid nasty surprises, Be sure to backup your phone to a physical memory card or using Nokia Suite and then mount the E: drive in mass storage mode and file copy its contents to your PC. Unless you can find a copy of Social 1.3 somewhere or wait for Nokia’s promised fix, the only solution to the Galley sharing issue seems to be a hard reset. This entry was posted in Nokia and tagged Nokia Belle, Symbian by Dennis Bournique. Bookmark the permalink. oh .n8. have super mobile…low cost but more fearures..but. some problem.pls correct errors.and .start this market.i am bharath.chennai in namakkal district.i study in paavai polytechnic college…in pachal.because clg students .say .its correctly.